You are at:Home»Products»Paints and Stains»Bradite ‘One Can’ – What’s the hype about? What is Bradite ‘One Can’? 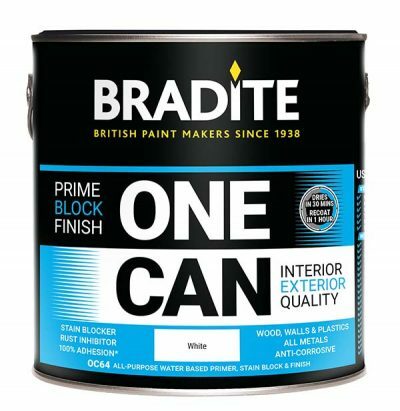 Bradite ‘One Can’ is a primer, undercoat and finish all in one can. It is not a ‘short cut’ product, but a carefully engineered, professional coating. ‘One Can’ is suitable for brush, roller and spray application and it is available in full BS and RAL colour range. It is suitable for most interior and exterior application; previously painted and new woodwork, UPVC windows and doors, glass, plastic and metal guttering and pipes, new and weathered galvanised steel and aluminium shop fronts, hardwood (sealing in resin bleed) soft woods and pre finished substrates, even ceramic tiles. ‘One Can’ is fully anti corrosive and can be used for painting external steel. Rust should be removed to clean metallic finish and three coats applied for a full system. What finish can be expected? ‘One Can’ gives a flexible, hard eggshell finish making it ideal for interior and exterior painting over all substrates, including wood, metal, plastics melamine, Formica, MDF and powder coated and pre-finished surfaces. Due to its superior adhesion qualities, it is ideal for those hard to paint surfaces. Minimal preparation for most applications, just degrease and lightly abrade to provide a key. ‘One Can’ dries quickly to a hard finish, meaning a recoat can be applied in just 1 hour. This efficient system results in less down time and extra days on the job. For example, kitchen units and pre-finished furniture can be painted with three coats in a single day. It’s a water-based product with very low odour, so painted areas can be back in use the very same day. For this reason, the product is ideal for painting hotel rooms and office buildings that need to be back in operation as soon as possible. Sounds good, but can it really stop bleed? Yes. As a stain locker, the ‘One Can’ formula will lock in many stains, preventing bleed into the finish coat. It works on water and resin stains, new and weathered bitumen and many more. Upon application of the first coat, it will lock and block the stain in to the ‘One Can’ coating. This will be seen as a discolouration. The unique formulation of the product will, during curing, locks and holds the stain to prevent any further bleed. This coat must be allowed to fully dry for at least one hour, over application can lead to an increase in drying times. The second coat should fully lock the stain. 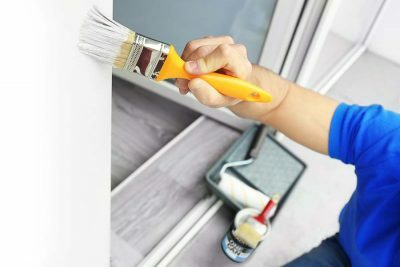 In some extreme cases, the stain may still be visible after the second coat, a third coat of ‘One Can’ or your chosen finish coat should complete the job.